I *think* Dani's picture shows the one house in the neighbourhood where the owner is overdoing the christmas decoration. Totte seems to be into RPG (Role playing games). 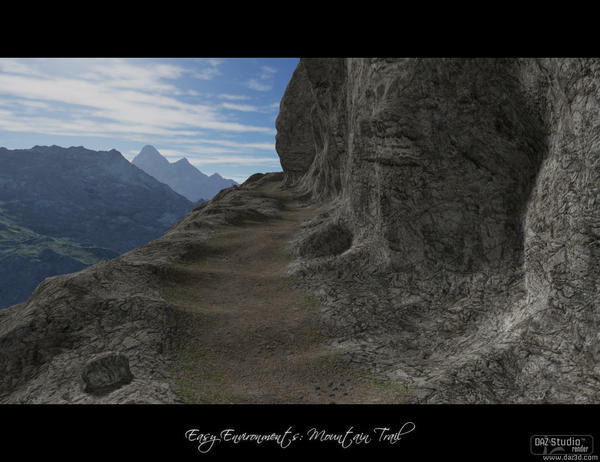 Next in line is "Mountain Trail", to be released later this week. I Hope you`ll like it! Releasing Winter first was mostly a seasonal decision, I think if it would have been about showing the benefits of the skyboxes I`d have rather started with this one. When up in the mountains you`ll naturally want to look downwards sometimes, and the complete scene coverage of the box really helps here, I hope the previews display that well. Looks amazing Flipmode...can't wait to learn how to use these products! Anyway, I am sure you`ll get into that stuff in no time. I don`t know what software you use, but if you feel you struggle too much, maybe just try the other one? will the mountain be an add on, or is it standalone? standalone, no need to own Winter for it. 1) Make each of the six cube faces emitters in Lux. This is simple to do in Reality, but will be a performance killer for Lux to render. I do already, and I can't even try placing any of my characters in it (yet). cwichura, I think you asked a similar thing on another one of my products (my memory is weak though), so probably you know already that I unfortunately know naught about Lux. With that out of the way, I don`t see why Lux shouldn`t be able to render a skybox. The materials in DS/Poser are simple, there is nothing special about them. Basicly it`s just ambience. The skybox textures are LDR, to be honest I am not even sure if DS and Poser can handle true HDR image formats (HDR lighting/rendering is a different thing afaik). As for environment maps, when I did the quick UberEnvironment2 test (a few pages back), I simply used the skybox top texture. Certainly not perfect or useable for reflections, but good enough for basic lighting. Anyway, if you wanted to render the complete scenes (terrain & skybox) with Lux, i guess you`d be in for quite some lighting tweaking. Sorry if none of the above makes much sense, like I said, I don`t know Lux...just trying to give some general info that may or may not help. Amazing. I'm soooooooooooooooooo impressed. Can't wait for this next set. Thx Spit, glad you like it! & thx Zaarin for the info, I stand corrected then. Got to admit I never payed it much mind, I mostly perceived HDR as a thing in games, where it goes together with other stuff like blooming or lens effects. Looking forward to the mountain pass set! 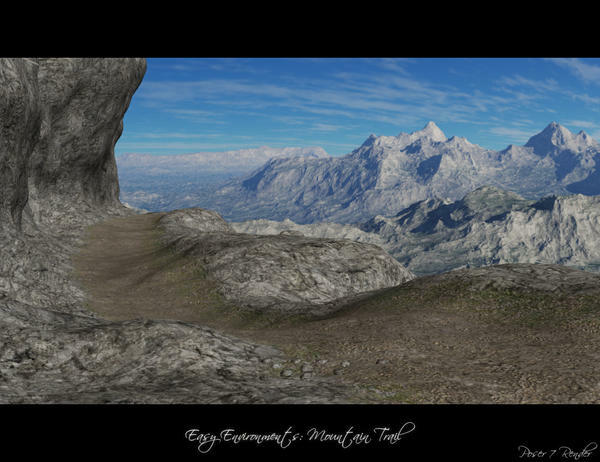 Mountian Pass is yet ANOTHER need now set... Wow. Everything comes together so well, looks like it was all one set. I have to ask, what is this "neighborhood" thing? Totte said it on the previous page, and I start thinking I didn`t get it at all. Seems to be some (american?) christmas thing? It's a foo-foo house! The house that is so over-decorated that it looks like Santa Claus threw up all over it. There generally is one in every neighborhood. But there are also neighborhoods that go mad for decorations as a competitive sport. People often make a trip to go and goggle at the results a part of their holiday tradition. Love the new mountain trail...the snow set is great too! these look brilliant! I'm not interested in the winter one as I don't do winter scenes at all - having never seen snow in my life, it just doesn't grab me to render it. LOL. However, the mountain trail one grabbed me completely and I WANT IT!!!!!!!!!!!!!!!!!!!!!! Depth of field also goes very well with landscapes, I might do a seperate tutorial on that later if there is interest in it. Well, there is interest from me, that's for sure. Wake me when the mountain trail is released - I'll be jumping on that for sure!!! It's a foo-foo house! The house that is so over-decorated that it looks like Santa Claus threw up all over it. Pendraia, looks great already, I like how the wheels of the cart are sunken deeply into the snow. And it`s nice how it kinda tells a story, I mean, the set pieces make sense. Please update with the final version when you have it ! @ jakiblue ...I am of a mind to do a quick depth of field tutorial soon, but I could only cover DS ...I am not good enough with Poser to teach anyone anything there. I tried to write it for DS beginners, explaining the most basic things. Well, it`s the first tutorial I ever wrote, and I am no native speaker, so I hope it`s readable. Nope, back to school with you!